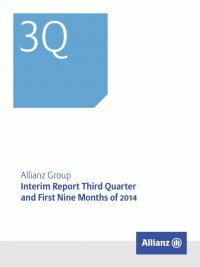 Interim Report Third Quarter and First Nine Months of 2014 Allianz Group8 Income taxes Income taxes decreased by € 114 mn to € 632 mn, despite higher income before income taxes. The effective tax rate decreased to 27.2 % (3Q 2013: 32.8 %). The lower tax rate is especially due to one-off tax benefitsforcurrentandpreviousyearsamountingintotalto€ 158 mn as previously described, that are fully allocated to policyholders. Overall, there is no impact on operating profit or on shareholders’ net income. These one-off tax benefits result from a favorable court deci- sion received in the third quarter of 2014 for a trial initiated by ­Allianz Leben in Germany. Absent this effect, the effective tax rate would have been approximately 32 %. In the first nine months of 2014, income taxes decreased by € 74 mn to € 2,373 mn and the effective tax rate decreased to 31.0 % (9M 2013: 32.8 %), mainly due to one-off tax benefits. Net income 2014 to 2013 third quarter comparison Net income increased by € 157 mn to € 1,687 mn, driven primarily by our higher operating result and lower non-operating impairments. Net income attributable to shareholders and non-controlling interests amounted to € 1,606 mn (3Q 2013: € 1,445 mn) and € 81 mn (3Q 2013: € 85 mn), respectively. The largest non-controlling interests in net income related to Euler Hermes and PIMCO. Basic earnings per share increased from € 3.19 to € 3.54 and diluted earnings per share increased from € 3.14 to € 3.52. For further infor- mation on earnings per share, please refer to note 39 to the con- densed consolidated interim financial statements. 2014 to 2013 first Nine Months comparison Net income increased by € 279 mn to € 5,285 mn, driven primarily by our higher operating result. Net income attributable to shareholders and non-controlling interests amounted to € 5,002 mn (9M 2013: € 4,740 mn) and € 283 mn (9M 2013: € 267 mn), respectively.